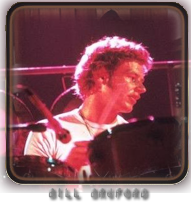 Bill Bruford is a drummer known for innovative playing with classic rock and jazz groups such as Yes, King Crimson, UK, Genesis, Patrick Moraz, Al Di Meola, Chick Corea, ABWH and many others. Specializing in odd time signatures and a distinct high pitched snare, big roto toms and pioneering the use of percussion electronics, Bill�s sound has always been recognizable as his own. His classic solo albums such as �One of a Kind� feature great players such as Alan Holdsworth, Jeff Berlin and Dave Stewart. Bill continues currently with his acclaimed �Earthworks� project recording and performing music that stretches the boundaries of instrumental music even further.